The general appearance of the Labrador should be that of a strongly-built, short-coupled very active dog. Compared with the Wavy or Flatcoated Retriever he should be wider in the head, wider through the chest and ribs, wider and stronger over the loins and hindquarters. The coat should be close, short, dense and free from feather. The skull should be wide, giving brain room; there should be a slight ´stop´, i. e. the brow should be slightly pronounced so that the skull is not absolutely in a straight line with the nose. The head should be clean cut and free from fleshly cheeks. The jaws should be long and powerful and quite free from snipiness or exaggeration in length; the nose should be wide and the nostrils well developed. The ears should hang moderately close to the head, rather far back, and should be set somewhat low and not be large and heavy. The eyes should be of medium size, expressing great intelligence and good temper, and can be brown, yellow or black. The neck should be long and powerful and the shoulders long and sloping. The chest must be of good width and depth, the ribs well sprung and the loin wide and strong, stifles well turned and the hinderquarters well developed and of great power. The legs must be straight from the shoulder to ground, and the feet compact with toes well arched and pads well developed; the hocks should be well bent and the dog must neither be cow-hocked nor move too wide behind; in fact, he must stand and move true all round on legs and feet. 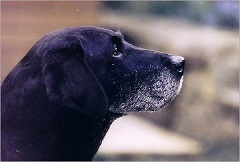 The tail is a distinctive feature of the breed; it should be very thick towards the base, gradually tapering towards the tip, of medium length, should be practically free from any feathering, but should be clothed thickly all round with the Labrador´s short, thick, dense coat, thus giving that peculiar `rounded` appearance which has been described as the `otter`tail. The tail may be carried gaily, but should not curl too far over the back. The coat is another very distinctive feature; it should be short, very dense and without wave and should give fairly hard feeling to the hand. The colour ist generally black, free from any rustiness and any white markings except possibly a smal spot on the chest. Other whole colours are permissible.